Self discovery is a great achievement which results into stunning performances by the individuals who manage to explore themselves. Once an individual identify various aspects of his being, he does not only try to improve them but also try to maintain a good balance so as to live a happy and successful life. 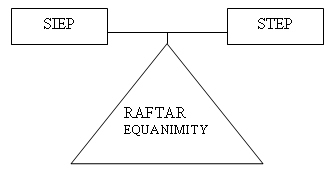 In this article which is a part of Raftar series an endeavor is made to explain in crisp and short way as to how we can create equanimity in our life by pondering upon these four constituents of human beings and relating them with four STEP factors. It is a known fact that the progress of any aspect is directly related to the time and energy spend upon that aspect. Any one can achieve great power and skills in any field if he spends desired amount of time and energy. Therefore human beings need to gain power and skill in spiritual, Intellectual, emotional and physical aspects of their beings. Any aspect neglected will create an imbalance that will cause failures in other fields. The importance of having the power and skill can well be estimated from the verse 47, Sura 51 ‘Adh Dahriat’ which says. Spiritual Power: – Human beings can grow this aspect by practicing gratitude and thanks to Almighty Allah for all His provisions and blessings. Spiritual Skills: – Spiritual well being connectedness and inner satisfaction can only be achieved through regular rituals of faith, prayers and religious practices. Intellectual Power: – This power is achieved through knowledge. Human mind or intelligence works best once it knows the truth and regularly updates itself with requisite knowledge of all the things with which one interacts. Intellectual Skills:- These skills can only be achieved through continuous and never ending improvement and learning. Mind stops working only once it stops to learn more and new. Japanese have used the word ‘Kazen’ (Continuous improvement) for acquiring this skill. These are those aspects which directly relates to ones heart, feeling, moods and emotions. Emotions are a great force multiplier and a great source of energy for all human beings. Their control and use have a pronounced effect on any outcome. Emotional Power: – The strength of emotional power lies in love. All the great thinkers writers, poets, intellectuals and even the prophets propagate that love is the only strongest force of our existence. Every thing one wants to be, do or have comes from love. Emotional Skill:- The skill is the learned capacity to carry out predetermined results often with the minimum outlay of time, energy or both. Thus the emotional skills can be achieved through humbleness and showing kindness to all. A humble and kind person is the strongest man who generates the great emotional power of love. An aspect which relates to human body or appearance. This is the only visible aspect which can never be neglected and bears a paramount importance for the overall well being or happiness. The physical power and skill distinguish a person from a normal to a hero, champion or an adorable figure. Physical Power:- This can be achieved through good diet and habits. Any human being can be a strongest or a weakest person on this earth by changing or varying his diets and habits. Thus anyone desiring for a physical power should ponder upon these aspects. Physical Skill:- These skills can be achieved through proper and regular use of body and its muscles. Repetitive exercises and proper use of body enhances cardio vascular endurance, stamina, strength flexibility, power, speed, coordination, accuracy agility and balance. Conclusion: – As equanimity is a state of being calm, composed and stable, especially under stress. However this equanimity can not be achieved unless a balance in physical, spiritual and emotional aspects is created along with the intellectual/mind Facet of human being. If we ponder upon these four equations and spend time and energy to gain power and skill on these basic constituents of human being then we can be confident to have a Rafter Equanimity. The article above is an extremely realistic, intellectual and a self explanatory piece of writing.It comprises of various ways which if adopted guarantee a peaceful,prosperous and sucessful life. The concept of SIEP, STEP and the overwall concept of RAFTAR is truly an amazing one and especially in todays society where evils are spreading at the pace of wildfire, application and implementation of such ideologies can certainly lead to the benefit of the entire society as a whole. After reading this article,I would indeed want to appreciate the idealistic approach of the writer.I feel words arent enough to appreciate the endeavours made by the writer in creating an absolutely wonderful concept yet I would wish to thank the writer for opening many doors for me, doors to a better and imroved life. It is state-of-art article which ever i study in my life.Remarkable!!!!!!!!!!!!!!!! Studies also indicate that cutting down or quitting smoking altogether can also provide an improvement in the appearance of cellulite. This is mainly due to the fact that smoking causes damage to small blood vessels, which increases the risk for cellulite. Many women have planned their days and lives around worrying how they will cover up this confidence shattering skin problem. Are you looking for a way to reduce cellulite, so that you can start to wear the clothes that you want, when you want. If so this article shows numerous cellulite removal techniques. Additional Articles From "Raftar 786"